Lucy Farmer and her French penfriend Yvette have no inkling of what lies ahead of them when a parcel arrives from Lucy’s great-aunt Hepzibah. The parcel contains a golden corn dolly and the ominous message that “they may need its help soon”. Very soon they are plunged into a good versus evil struggle: the Corn Dolly comes to life to help them against Miss Marvell, the richest woman in town, who also turns out to be an evil witch using the blackest of magic to kill all good green growing things. Right from the first episode the girls are in danger from Miss Marvell, initially simply because they have gone somewhere they weren’t supposed to and seen something they weren’t supposed to – a great patch of bare grey earth in Miss Marvell’s garden, and plants that have crumbled to dust. The patch of grey earth is so strongly poisoned that the residue on the girls’ shoes poisons Lucy’s father’s garden too (and continues to do so in subsequent episodes even after he has patched it with new turf). Soon they are courting her anger more deliberately, once Corn Dolly has told them they must investigate Miss Marvell’s plans further. They are found and nearly caught in a secret room at the top of the witch’s house – her spooky henchthing, a scary mask, can communicate with Miss Marvell at a distance and do her bidding. Corn Dolly is their saviour this time, defending the girls with her strength from the sun and telling them to run to the trees, where the strength of living things will defeat Miss Marvell. However, this sortie has revealed jars and jars of death dust; there is only so much that Corn Dolly will be able to do to fight this black magic. The one thing she can suggest is a charm from ancient times, made with certain flowers, that can defeat witches. There follows a back-and-forth cycle that oscillates with bigger and bigger swings. Miss Marvell destroys some plants; the girls must gather flowers for the charm; Miss Marvell wreaks more destruction to prevent them from finding the next flower on their list; against great odds the girls manage to get the next flower; people round about get more and more nervous and worried and downright frightened. Miss Marvell tries more and more tactics to beat the girls: she kidnaps Corn Dolly right out of Lucy’s school bag despite the protective rowan berries that Lucy put in (in her guise as benign school governor, Marvell asks an unsuspecting girl to remove them), she brainwashes Yvette and later on turns Lucy’s mother against her French visitor. The girls have Corn Dolly to help them, but she is neither omnipotent nor always totally patient: more than once she tells them they have to work things out for themselves as she cannot always be with them. And indeed they are pretty resourceful: when the straw form of Corn Dolly is thrown on a fire by the vengeful Miss Marvell, they ask for sun and rain to douse the fire and strengthen her foe. They manage to ask in roundabout ways for important information like the location of a specific kind of rose for their charm, and enlist mundane help to deal with obstacles like an enraged bull or the antagonised mother. It’s a pretty long series of episodes, though, with these power struggles that seem to each end quite similarly, if growing in violence. The last five episodes take on a different tempo: the ministry of agriculture forbids any entry to or exit from their town of Haylton until they find out what killed all the plants at the zoo (and the authorities are never going to figure out that the answer is black magic, of course). This means that the girls have to find out a way to escape from the town to get the last few flowers for the spell; it becomes a race against the forces of evil to get to another source of help – Great-Aunt Hepzibah in Cornwall – gathering the final ingredients on the way. Of course Miss Marvell is not far behind, inciting whoever shelters them to know “black, cold fear!” She too has allies – three evil witch ghosts in a haunted village, but once again Corn Dolly and the forces of the sunlight – or in this case, a timely lightning strike – defeat them. The showdown is at the site of a “giant’s circle” on the shortest night of the year, but one which feels very long to the girls, chased as they are by Miss Marvell and the trees in an evil wood. The stone circle is perhaps something else that the witch thinks will be helpful to her, but the girls use the charm along with the first sun of midsummer’s day – and Miss Marvell is literally vanished away, and her death dust with her. This is a powerful story, if one which on re-read can feel a little long in parts as the girls gather their various different ingredients. The sample story pages included above are ones that I know I have not read for over thirty years until Mistyfan sent me scans, but the image of Miss Marvell scattering death dust on the buddleia is one that has been with me all the time since then (though as an adult I have been in more sympathy with the death-dust wielder, as this is a nearly-unkillable weed). Miss Marvell’s (rather un-African though so-called) mask, along with her cackling gleeful face calling down a storm, was part of the cast in my childhood nightmares. Luckily for me, Corn Dolly stood beside my bed (with other symbols of good such as Epona from “Guardian of White Horse Hill”) to defend me. There is a noticeable hippyish streak in this story: the environmental struggle to protect the trees and the wildlife, the fact that the dark witch’s alter ego is that of a rich and powerful establishment figure* who is able to do some of her wrong-doing purely because she knows the right people to ask favours of. (There is a counter-example lord who is on the side of the good guys, but he is seen in only one episode.) Perhaps the self-sufficiency of the protagonist girls, prompted on occasion by the odd pointed comment by Corn Dolly, is also a reflection of that countercultural angle? * Interestingly enough, Miss Marvell is also depicted as something of a scientist, with a laboratory in which she tests her death dust for potency. 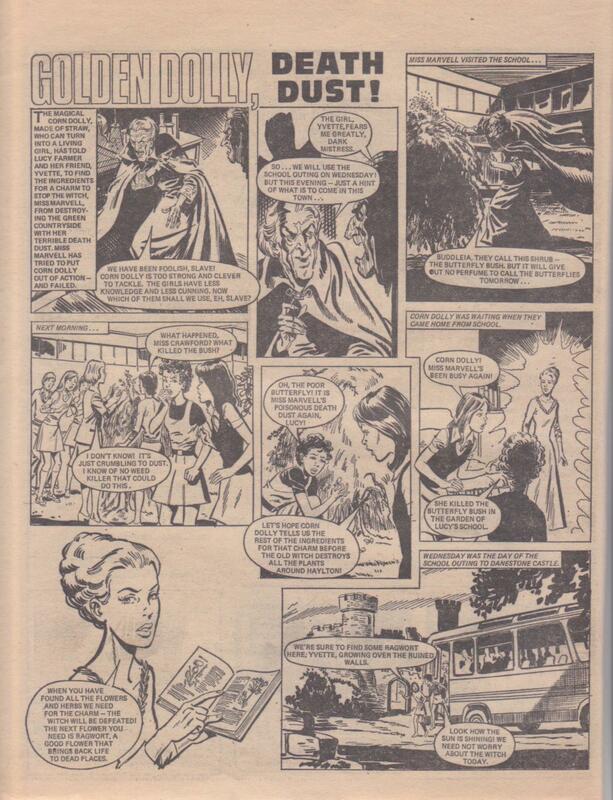 In this she is a little reminiscent of the villain in subsequent story “Girl In A Bubble”, also drawn by Phil Gascoine. It is however pretty much a quest story. The extra layers that draw you in are attributable, I think, to Phil Gascoine’s narrative skills as much as anything: the contrast between the peaceful countryside or small town and the dark, twisted woods in which Miss Marvell aims to trap our protagonists; or between the limpid beauty of Corn Dolly and Miss Marvell’s increasingly wicked cackling face. There is an environmental element here too. I wonder if “Silent Spring” 1962 by Rachel Carson was an influence? This book documented how the use of pesticides and other chemicals was poisoning the environment and was a powder keg for ecological disasters. Silent Spring made a huge impact when it was published. Incidentally, several months after Golden Dolly was published, the warnings of Silent Spring bore out in the 1976 Seveso disaster, in which a leak from a chemical factory sent a dioxin cloud over the Seveso area in Italy. Dioxin is one of the biggest poisons known to humanity, so the health, environmental, social and political impacts were catastrophic. I wouldn’t be surprised if Silent Spring was indeed an influence. Certainly the idea of industrial pollution seems to be a tacit underlying theme – the scientist witch poisoning living things.